Paul is proud to announce the release of his first DVD. 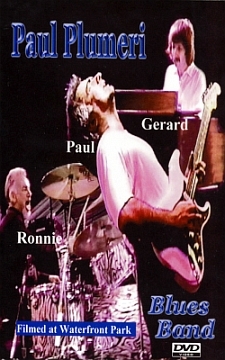 This concert from 1998 captures a performance by one of the hottest versions of The Paul Plumeri Blues Band of the 90's. The band includes the incredible Hammond B3 work of Gerard and legendary NY session drummer, the late great Ronnie Hand. Pick up a copy at one of Paul's live shows for only $10. or mail in this order form. the 2006 Evolution of the Blues Guitar show. Evolution of the Blues Guitar show. Paul & Joe from the 2004 Ernie White Christmas Benefit.